PIMOT participates in the process aimed at ensuring unambiguous identification of all vehicles in the world as well as unambiguous identification of the company that is specified as the maker of a part. PIMOT has been providing this service since 1979 on the grounds of Order No. 27 of Director General of the Automotive Industry Union of 1 October 1979 regarding the introduction of a world vehicle manufacturer code. Pursuant to the “Road Traffic Law” Act (Dz. U. No. 108 of 2005, item 908, with later amendments), the vehicle participating in road traffic should have identification marks given by the vehicle manufacturer. The basic mark of this type is the Vehicle Identification Number (VIN). The requirement that every vehicle should be provided with a Vehicle Identification Number (VIN) has been laid down in Regulation of the Minister of Infrastructure of 31 December 2002 regarding the technical requirements applicable to vehicles and the scope of vehicle equipment required (Dz. U. No. 32 of 2003, item 262, with later amendments). The instructions regarding the contents and structure of the Vehicle Identification Number have been given in standard ISO 3779:2009 “Road vehicles. Vehicle identification number (VIN). Content and structure” and its Polish equivalent PN-92/S-02060 “Pojazdy drogowe. Numer identyfikacyjny pojazdu (VIN). Części składowe i budowa,” with the title of the Polish Standard being a literal translation of that of the ISO document. These standards define the method of identifying a vehicle by the codes (numbers) being parts of the VIN, which consists of 17 characters. The first segment of the VIN is a World Manufacturer Identifier (WMI). The WMI setting rules have been formulated in standard PN-92/S-02062 “Pojazdy drogowe. Światowy kod identyfikujący producenta (WMI)” (“Road vehicles. World Manufacturer Identifier (WMI)”). 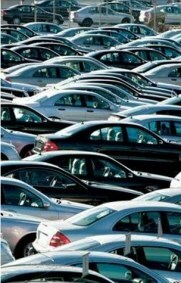 If the vehicle production output declared by the manufacturer is below 500 vehicles a year then PIMOT, pursuant to item 6.4.2 of the standard, assigns not only the WMI code but also the third, fourth, and fifth character of the VIS code to the vehicle manufacturer. PIMOT as a Polish National Organisation referred to in the standard specified below assigns specific WPMI codes to individual vehicle part manufacturers. The WPMI code is assigned in accordance with the guidelines given in standard PN-92/S-02063 “Światowy kod identyfikujący producentów części (WPMI)” (“World Parts Manufacturer Identifier (WPMI)”). The WPMI code makes it possible to identify the manufacturer that is specified as the maker of a part. For a WMI or WPMI code to be assigned, the manufacturer of a specific part shall submit a filled-in application form together with all the documents required to the PIMOT Quality Centre. Having verified the application, PIMOT will inform the International Agency acting with authorisation of ISO, i.e. Society of Automotive Engineers, Inc. (SAE) in the USA, through the Polish Committee for Standardization, about the code assigned. Central Forensic Laboratory of the Police (Al. Ujazdowskie 7, 00‑583 Warszawa). More details on the code assigning procedure may be obtained from the PIMOT Quality Centre.